If you need to change money, there’s a Raiffeisen bank with an ATM among other banks, in Jugoslávská street, that’s the street at the lower end of námestí Míru square down to metro C line stop I.P. Pavlová (Which connects you with both the main railway station, Hlavní nádraží, as well as with bus terminal ÚAN Florenc). There is also a bank with an ATM in Vršovické náměstí 67/8, that’s a short walk down Donská street. Turn left at the next corner down Charkovská street till you bump into Krymská street, turn right and walk down a 160 m to a subsidiary of Česká spořitelná bank. Rather abstain from changing at private exchange offices; some of them offer very disadvantageous exchange rates. It is not recommended to pay in € at restaurants and shops either, unless they publish their exchange rates. The local currency is Czech Crowns, CZK. The Czech Republic is not a member of the Euro countries. 1 € and 1 US $ are approx. CZK 25 (September 2015). See precise exchange rates HERE. 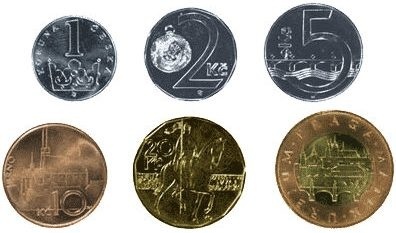 Coins: CZK 1, 2, 5, 10, 20 and 50, banknotes: CZK 100, 200, 500, 1,000 and 2,000. 2) ATMs deliver sums in steps of CZK 200, e.g. CZK 400, 600 or 1,200 etc. If you punch in a sum of CZK 1,000, you get a KC 1,000 banknote, which is not very useful for small shopping; rather request CZK 800 or 1,200 etc.